Born and raised on a cattle property in Central Western Queensland, Jayde is a self taught, contemporary artist with a background in interior design. Jayde now lives with her husband and four children on 7000 hectares, 40km south of Barcaldine. 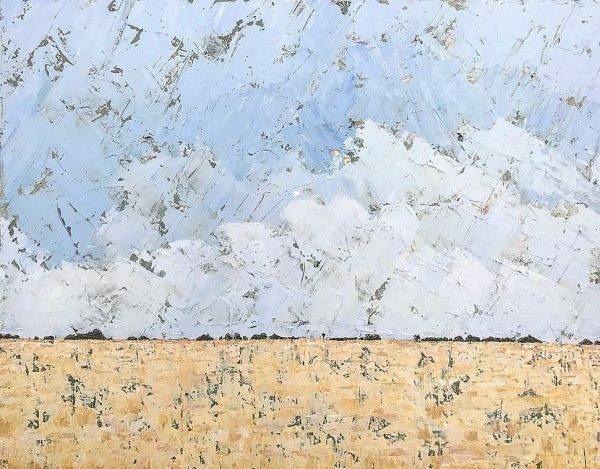 Inspired by her rural surrounds and memories of her childhood, Jayde uses palette knives to create textural, expressionistic landscapes and vibrant abstracts. Her love and deep connection to the land is evident in her diverse works. Jayde hopes to bring raw beauty, style and joy into the homes of her collectors through her original multilayered pieces. My favourite sky to date and such a well loved scene. One that people around here haven’t seen for years with all that golden feed #bulkfeed but hopefully we will see again soon 🤞🤞🤞 I have donated this piece to the St Hilda’s Foundation Disaster Relief for auction at their A Day at the Races 🐎🐎🐎 Money raised at this auction will go to families affected by the devastation in the North of our state and others affected by disaster. As an old girl it is an honour to contribute to this great cause so get behind it and bid up!